Staffing World 2012, Oct. 9–11 in Las Vegas, is the can’t-miss event of the year for staffing and recruiting executives. The featured keynote speaker is business consultant and author Jim Collins—and registration is now open. Register online today. The ASA annual convention and expo is the largest, most comprehensive event tailored specifically for the staffing industry. 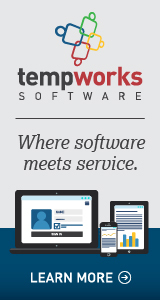 Nowhere else but Staffing World can staffing executives tap the top-notch professional development, top-level networking opportunities, and top-drawer products and services they need to take their firms—and the staffing industry—to the next level. 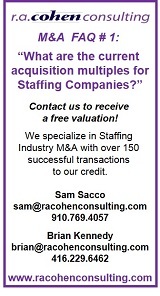 Visit staffingworld.org for details. Save up to $400 per person when you register by May 18. Jim Collins’ keynote is sponsored by ASA corporate partner World Wide Specialty Programs Inc.
U.S. jobless claims dropped by 12,000 to a seasonally adjusted 367,000 in the week ended Jan. 28, the U.S. Department of Labor said Thursday. The median forecast of 46 economists in a Bloomberg News survey projected 371,000. The four-week average of claims fell by 2,000 to 375,750. Companies are slowing the pace of firing as the U.S. economy picks up, a necessary step toward bigger gains in employment. The U.S. manufacturing sector grew in January, and indicators point to additional growth in the coming months. The Institute for Supply Management’s index of overall activity climbed by one point to 54.1 in January from the prior month, roughly corresponding to economists’ forecasts. However, several economists believe it will be difficult for U.S. manufacturers to continue expanding at their current pace, due to an overall slowdown in the global economy. Small businesses with fewer than 50 employees added around 95,000 jobs in January, down from 136,000 in December and 111,000 in November, according to the new report from Automatic Data Processing Inc. While small-business owners are more optimistic about conditions at their firms, that optimism has not been translating into a hiring surge. Over the past year, 22% of the 450 business owners polled added to their payrolls, and 30% expect to do so this year. Moreover, the number of small businesses posting revenue gains, expressing confidence about the future, and obtaining financing has increased since the previous survey in July. However, Todd McCracken, president of the National Small Business Association, notes the improving conditions have not prompted small businesses to increase hiring because they want to be in a better cash position before doing so. He says hiring employees is “a long-term decision,” and small businesses will remain cautious until they feel more confident about the broader economy. Construction spending rose 1.5% in December, marking the fifth consecutive monthly gain, reported the U.S. Commerce Department. Builders spent on homes and other projects at a seasonally adjusted annual rate of $816.4 billion, the highest level in 20 months. For 2011, outlays on building projects totaled just $787.4 billion, down 2% from 2010 and roughly half the level that economists deem as healthy. The high unemployment rate has not put the brakes on staffing firms, as evidenced by the success of Oklahoma City-based Express Employment Professionals. To date, the company reports it has helped five million people find work through its 560 franchises. Robert Funk, chief executive of Express, says in an effort to become the nation’s No. 1 flexible staffing firm, the company plans to increase revenue from $2.1 billion to $3.4 billion and open as many as 70 locations annually in such places as Vermont, San Antonio, San Francisco, Boston, and Orlando over the next few years. ASA is committed to helping member companies create an environment where employees can thrive and clients can be assured of your commitment to principles, integrity, and fair dealings. As a condition of membership in ASA, each member pledges its support of, and adherence to, the principles and practices set forth in the ASA Code of Ethics and Good Practices. In an ASA survey, clients said that the association’s code of ethics is the most important reason to work with an ASA member. The code helps companies support a positive image of the staffing industry and foster good relations with employees. To download the ASA Code of Ethics and Good Practices, visit americanstaffing.net. The Texas Supreme Court issued an important ruling on Jan. 27 preserving workers’ compensation protection for staffing firm clients in Texas. The American Staffing Association and the Texas Association of Staffing, an ASA-affiliated chapter, filed an amicus brief in the case. At issue was whether a client’s workers’ compensation policy protected the client from a wrongful death lawsuit after a temporary employee assigned by a staffing firm was killed on assignment in a grain silo. The Supreme Court held that, under Texas law, an employer’s workers’ compensation policy cannot cover some employees but not others. Because the client had secured a policy covering its employees, and because it was uncontested that the employee was jointly employed by the client and the staffing firm, the court found that the temporary employee was covered and thus dismissed the lawsuit. The government has been cracking down on companies that treat workers as contractors for wage, tax, and benefit purposes but as employees when it comes to their work duties. An audit conducted by either the U.S. Internal Revenue Service or the U.S. Department of Labor can overwhelm a small business—even if the issues raised turn out to be unfounded. Kevin McCoy, partner with Kruchko & Fries, a labor and employment law firm based in McLean, VA, notes employers most often slip up when they try to fill a part-time or short-term need with an independent contractor, thinking that because the position is less than full time or of limited duration, it can be filled by a nonemployee. However, if an employer tells someone when, where, and how to work, that is not considered a contractor relationship. Along with knowing the law, companies hiring contractors need to hire carefully. Kathleen Benson, president of Herndon, VA-based research firm ORI, says contractors are a quick and cost-effective way to bring in high-level talent with specialized expertise for data-intensive projects. ”One of the benefits of an independent contractor is that you can really zero in on very specific needs and skill sets,” says Benson, who uses temporary staffing firms like Flexforce Professionals in addition to ORI’s network. During the screening process, ORI checks references and conducts background checks. To ensure legal compliance, contractors must show proof of insurance and a record of self-employment tax payments. They must also maintain a dedicated work space, since many work from home. In a recent paper published in Organizational Dynamics, Wharton professor Peter Cappelli says corporate managers often do not sufficiently consider risks when hiring temporary or contract workers, generally focusing on operational costs instead. A January 2012 survey by ASA and ASA corporate partner CareerBuilder predicts an increase in U.S. companies hiring temporary or contract workers to 36% this year from 34% in 2011. Cappelli says managers should take a systemic approach to risk management when making decisions about outsourcing, and rather than focus on reducing costs, they should concentrate on reliability and responsiveness. Inbound marketing company Grass Roots Marketing has announced the results of a case study, “Inbound Marketing for Staffing Agencies.” The study examines the Web site grade and social media platform activity of about 250 staffing firms; 233 were identified as American Staffing Association member firms, and 25 were identified as the biggest staffing firms in the U.S. The upshot of the research was that typical staffing firms can boost their sales by allocating more resources to inbound marketing tools, and smaller firms can be just as effective as the top 25 firms. According to the survey, six of the eight most effective marketing tactics were Internet-related. These included a company Web site, e-mail blasts, social media, search engine optimization, e-mail newsletters, and search engine advertisements.